Home > PremiumSoft CyberTech Ltd.
Found 16 file extension associations related to Navicat for PostgreSQL (Mac) and 1 file format developed specifically for use with Navicat for PostgreSQL (Mac). 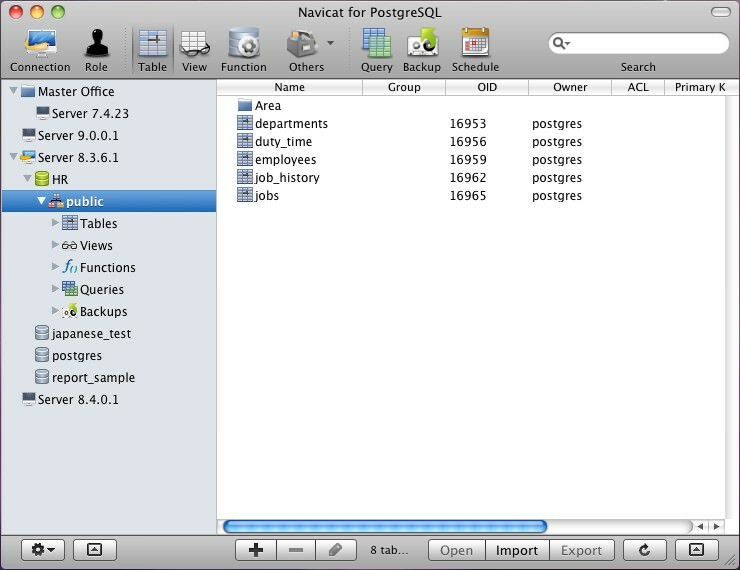 Navicat for PostgreSQL is a powerful Database administration and development tool for PostgreSQL. It works with any PostgreSQL Database Server from version 7.3 or above, and supports most of the latest PostgreSQL features including Trigger, Function, View, and Manage User, etc. Features in Navicat are sophisticated enough to provide professional developers for all their specific needs, yet easy to learn for users who are new to PostgreSQL. If you need more information please contact the developers of Navicat for PostgreSQL (Mac) (PremiumSoft CyberTech Ltd.), or check out their product website.